Aspiga Aruba is not only a beautiful design, but an item that comes from some of the best people in the swimwear industry. Aspiga designs here in the UK, but they make their items in Africa and Asia, hiring traditional communities to make these items using the authentic and original methods of making garments. This brings new prosperity to the villages and communities where they are made, revives their ancient arts and gives you a unique item to take with you on holiday. 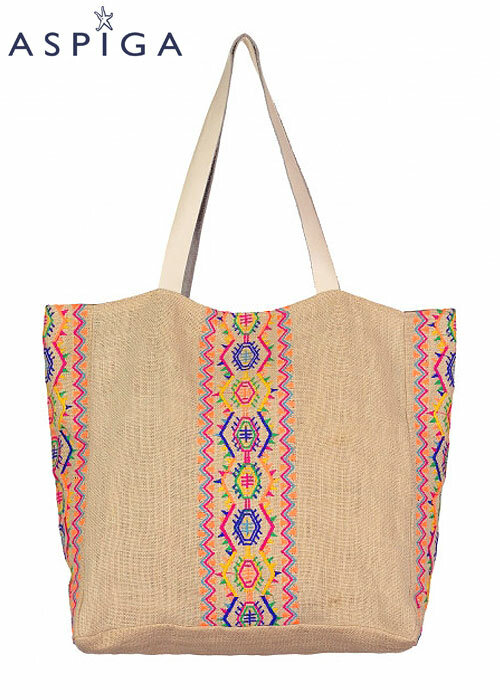 This beach bag is a beautiful one and really captures some of the most well known motifs of the time and place that these designs come from. It is made with all natural hessian and and has a magnetic closure to keep sea spray off your things. It is practical, beautiful and ethical.